FOX8 -- Christine Quinn recently married her husband Patrick Quinn, and she had one of her best lifelong friends as a bridesmaid. It was her 89-year-old grandmother, a.k.a. Nana Betty, according to Huffington Post. Nana Betty even wore the same dress as the other bridesmaids. "You're only as old as you feel and I feel young today," Nana Betty said on the wedding day, according to the bride. 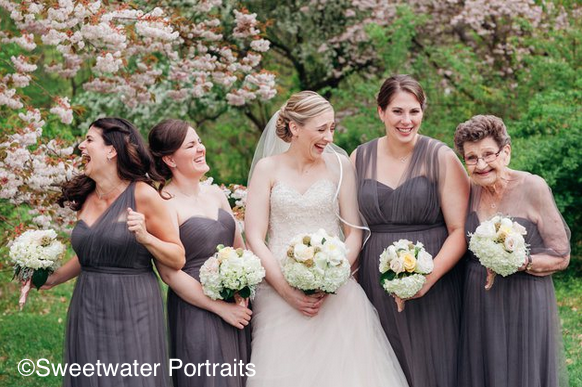 The bride said it just made sense to have her Nana Betty in her wedding, as they truly are best friends. "While she doesn't live that close, we have continually made it a point to spend as much time together as possible," she said. "She just has an amazing sense of humor and outlook on life that I strive to emulate every day. Everyone loves her." 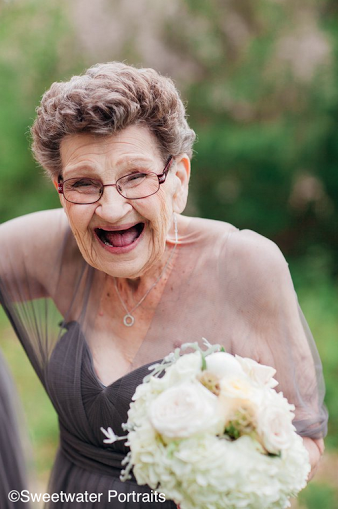 The bride added that her grandmother wasn't so sure about being in the wedding at first. "A few times she even said 'All of your bridesmaids are young and pretty, why would you want me?'" Nana Betty had a great time though, even joining the bridal party on the party bus. "She also danced the entire night away, including an adorable moment when she and my husband's grandmother, Bellsie, danced together. It was amazing," the bride added. Alternative wedding inspiration from Bergreen Photography showcases two different interpretations of Stevie Nicks’ song, Leather and Lace. Julia from l’Relyea Events developed a design incorporating leather, lace and the 1970s bohemian vibe the song embraces. The theme of this breathtaking styled wedding shoot from Custom by Nicole Photography is a dramatic and romantic interpretation of an old world circus! Instead of exploring the playful side of the circus theme, the team of vendors wanted to provide inspiration to brides looking for a sophisticated wedding that’s a little different than the norm. Photograhpy by Custom by Nicole Photography. Lindsey and Nate are from Huntsville, and they decided to elope in Chicago. To avoid the stress of planning a more traditional wedding, they opted to have a pop up wedding with their closest family and friends! Their ceremony was in the public gardens of the Art Institute of Chicago, officiated by one of Lindsey’s friends. Elizabeth Nord Photography captured their sweet, intimate elopement! Photography by Elizabeth Nord Photography. Andrea and Mike’s DIY summer wedding was filled with incredible details like giant round balloons with glimmering tassels, gold glittery table numbers, beautiful, vibrant flowers, and lovely watercolor signage! The venue only added to the charm of their celebration – a multipurpose cultural arts center in Chicago with over 250,000 square feet of curated hallways, rooftops and coves featuring emerging and established artistic talent from the city and worldwide. Laura Witherow Photography captured their day! Photography by Laura Witherow Photography. Megan and Mike brought their love of travel and their devotion to their families together to create a memorable wedding day full of vintage travel-themed details and personal family touches. Their incredibly special day was beautifully captured by Marissa Moss Photography! Photography by Marissa Moss Photography. With a simple arbor, glimmering sunlight, gold-accented florals, and the beauty of nature as their backdrop, the couple found their ideal setting in a place of simple and elegant rustic beauty. Nhiya Kaye Photography captured these beautiful moments! Photography by Nhiya Kaye Photography. What originally started out as a rockabilly inspiration shoot evolved into an edgy, dark rock and roll theme designed by Ivory & Beau and captured by Rach Lea Photography. Photography by Rach Lea Photography.